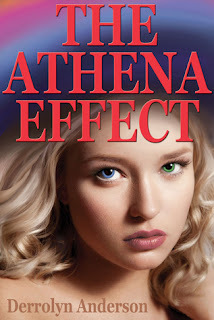 I really enjoy Derrolyn Anderson's writing, so I was excited to read her latest work, The Athena Effect. (Read my reviews of her paranormal YA series Marina's Tales here). I thought the summary was so intriguing, even more so that Cali and Calvin share a name, well, at least a nickname (they both go by Cal). I love reading about tough female main characters, and Cali fit the bill to a tee. She's resourceful, strong and independent. And that's not even considering her gift! Cali can manipulate the emotions of the people around her. At first, she thinks her gift only works on animals, but as the book progresses, she realizes she can change the emotions of humans too. Cali sees emotion as colors, like an aura around a person, and I thought that part of the book was really unique and well-done. I liked seeing people's emotions as colors, as it added another layer of interest to the story. At first, Cal seemed to be your typical bad boy. But there was more to him than met the eye, and he and Cali become friends (slowly on her part and not fast enough for him). I liked the slow progression to the love story. Anything quicker would have been unrealistic, considering Cali's sheltered upbringing. There was a lot of world-building in The Athena Effect, which did slow the story down at the beginning for me. But, that just means that the sequel will be even better because all the groundwork has been laid. If you like contemporary YA or paranormal YA, The Athena Effect is a great mix of both. I am looking forward to where Anderson takes the series!